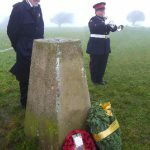 The Downs were shrouded in thick low cloud on 20 December 2017 for the commemoration of the 100th anniversary of the Royal Navy Air Service Airship disaster. 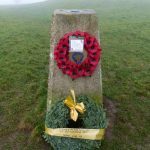 After meeting at noon on Butts Brow above the village of Willingdon, twenty-two people, including representatives of Willingdon & Jevington Parish Council, East Sussex County Council, the Willingdon branch of the Royal British Legion and a representative of the Eastbourne Member of Parliament made the 20 minute walk across the fields to the site of the crash. The site is high on Willingdon Hill beside the remnants of the old flint barns of what in 1917 had been Willingdon Hill Farm, on the border of Willingdon with Jevington. It was in a field next to these barns that two airships had moored when weather conditions of fog, snow and gales had prevented them landing at their station at Willingdon. 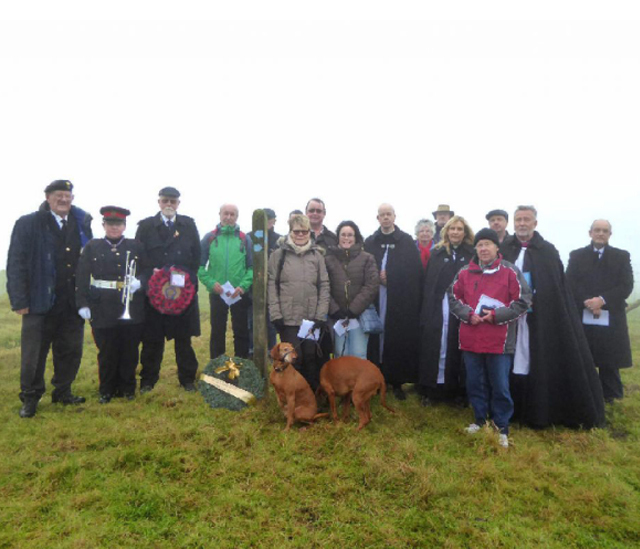 Once at the crash site, an Act of Remembrance was led by Fr. 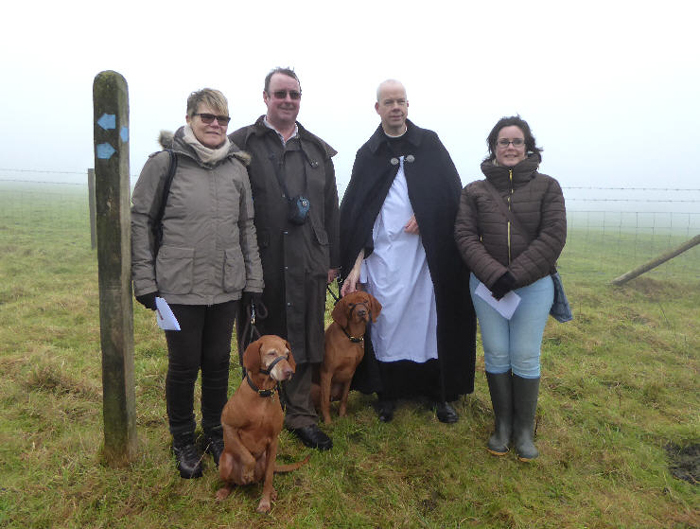 Kevin Agnew vicar of St Mary the Virgin church in Willingdon assisted by Rev’d Sue Wilkinson, deacon of the parish. 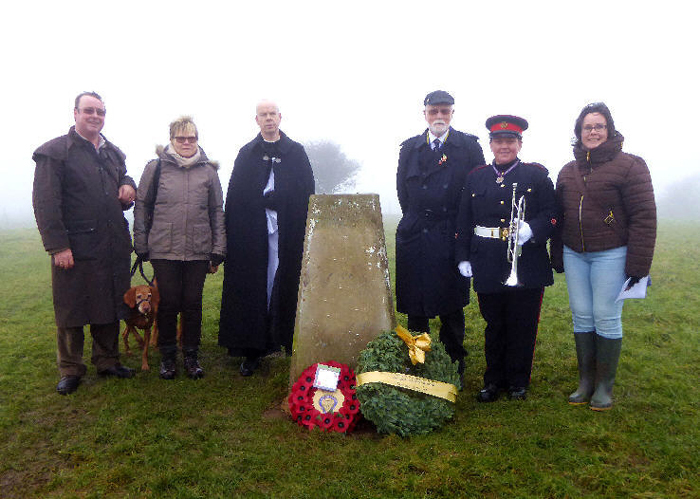 They were joined by Rev’d Martin Quayle who was a grandson of Air Mechanic Victor Dodd the 18 year old wireless operator, one of two crew, who had jumped from the blazing airship and survived. Martin Quayle gave a short description of the events which had led to the disaster when an airborne ship flying in fog and sleet had collided with one of those moored. 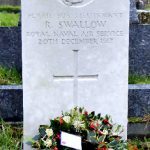 This had resulted in the death of Flight Sub-Lt Richard Swallow, pilot of airship S.S.Z.7, and the serious injury of three of his colleagues. 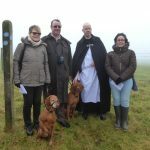 Four descendants of Victor Dodd had travelled that day from Shropshire and Leighton Buzzard to be present. 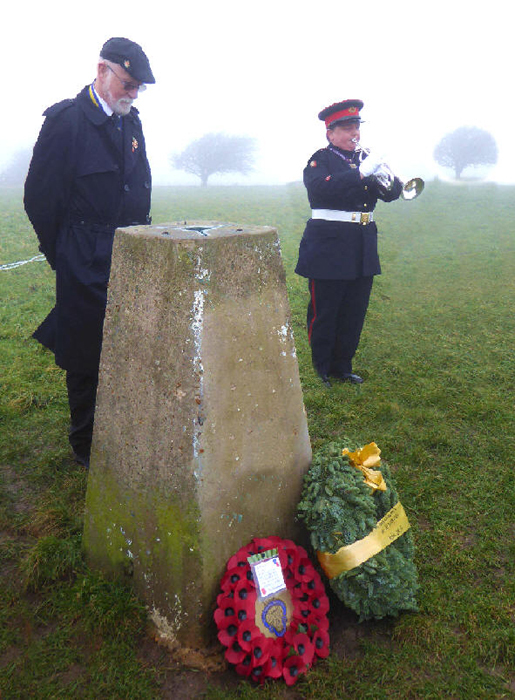 John Hemingway, chair of Willingdon Branch British Legion gave the Exhortation which was followed by the Last Post sounded by the Legion’s Sussex county bugler, Heidi Watkins; the sound drifting in the silence across the mist covered hills. Two minutes silence was observed followed by Reveille and the words of the Kohima Epitaph. 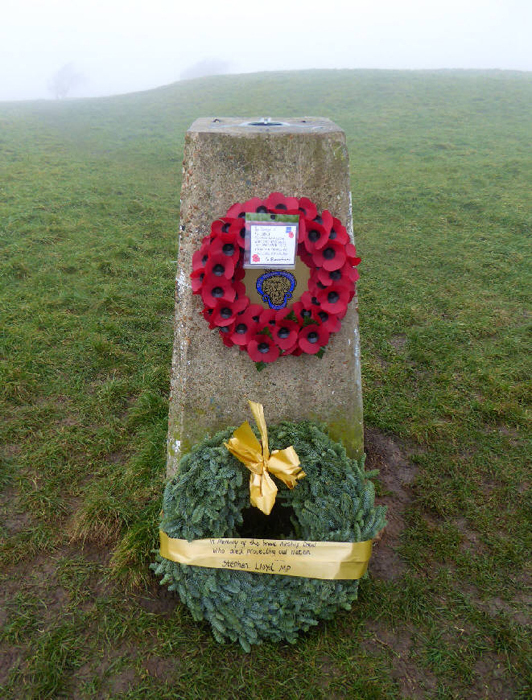 At the nearby Trig Point, overlooking the crash site, two wreaths were laid in memory of Flight Sub-Lt Richard Swallow. John Hemingway placed one on behalf of the People of Willingdon and a second was laid by David Edwards representing Stephen Lloyd M.P. The bugler played ‘Sunset‘. 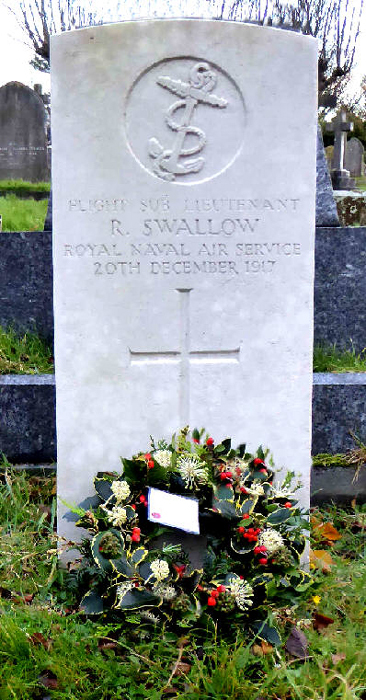 A number of people then went on to Richard’s Swallow’s grave in Ocklynge Cemetery, Eastbourne where the Last Post was sounded over his grave followed by the Naval Reveille. 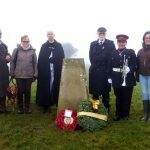 A wreath of evergreens picked in Willingdon was laid on Richard Swallow’s grave by the archivist of Willingdon Church in memory of this young man who had died on active service in Willingdon one hundred years ago.